Step by step she climbed quickly up the ladder. 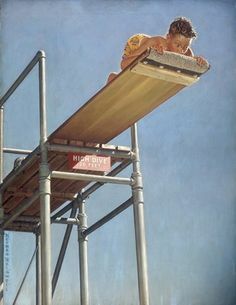 As she lifted her feet onto the diving board, she began her confident stride. I watched from the side of the pool. This girl seemed like a pro, until something changed. Her stride began to slow. She stopped abruptly. Her feet frozen to the middle of the board. The chill of her fear rose from her toes all the way up to her doubt etched face. I could almost see her tremble. The middle. It’s a tricky place to be. Too far to go back now, yet so much still lies ahead. It’s easy to get stuck there. Fear grabs on and won’t let go. Questions linger. Discouragement sets in. I don’t know if the girl standing on that board knew she might be standing face to face with fear today, but here she was unable to find the strength to take another step. I watched the drama of the moment unfold as I sat at the side of the pool. I had come today to watch my daughter’s swimming lesson, instead my eyes seemed to be glued to that board. This girl needed help. Slowly, silently help came. No one took this girl’s hand. No one forced her to jump or talked her down the ladder. Instead, the swimming instructor came as close as she could behind the girl. She didn’t touch her or talk to her. She simply became the girl’s shadow. The girl could feel the strength of the one behind her. She took a step forward, then another. Each time she moved her “shadow instructor” followed. Quiet strength gave this girl the momentum to go on. A few seconds later the girl stood so close to the end of the board that her toes almost curled over the edge. I knew she would jump. Do those words sound familiar? If they do, it may just be because Jesus speaks those words to our hearts though the bible. In Matthew 28:20 he says, “I am with you always, even to the end of the age.” I don’t know what fear you may be facing today. You may be wondering what to do. Maybe you are stuck in a situation and can not see a way out. Do you move forward or walk away? God hasn’t let you go, Dear One. He’s right there with you. He never left you. Sometimes when I feel fear, my first thought becomes, “Where is God?” I feel abandoned and alone. This simply isn’t the truth. God is always with you. He doesn’t leave just because you think He isn’t there. He’s a stubborn God full of love and mercy. He loves you so much that he’s willing to walk with you during your epic fails, yet doesn’t want you to stay fallen. He wants to lift you up on your feet and help you take the dive into the unknown. He knows the thrill that awaits you. He doesn’t want you to live only to survive, just doing the things that are safe. He wants you to dive. He wants you to thrive!Listen, Dear One, you will feel fear. Fear comes with every opportunity that is laid out before you. Ask God to give you wisdom today. Don’t doubt. He will give you the wisdom you need. While you are waiting, take another chance. Look around. Is there someone today you could loan a little strength to just by being present? Maybe it’s a child who needs a listening ear or a friend who needs to know she isn’t forgotten. Sometimes the best way to help our fear is to loan a bit of our strength to someone else. It’s okay if you don’t have all the right words. You will be amazed at what you can speak to someone’s heart without using any. Give someone the gift of you today. Put down your phone. Step away from that computer and just “be” with that with that person. Whatever God has laid on your heart today, don’t be afraid to take the next step. You are never alone. What happened next shocked me. I felt like I had just become part of a scene in the “What Would You Do?” tv show. A show in which people are tested with different scenarios to see if people will chose to do the right thing. My eyes searched for the child. There she was. She was probably five. I expected the two women to take her hand and help her. I saw something quite different. The women gathered their children and left. They did nothing to help this lost child. NOTHING. My attention turned to the little girl. She didn’t look distraught. No tears were on her face. She began to wonder her way into the building attached to the playground. That’s when I knew she was lost. I sat stunned. I still could not believe those people had done nothing. A few moments later, it finally hit me. I felt like I’d just been punched in the stomach. A sick feeling crept into my body. I did nothing. I could have taken that child by the hand and helped her. I let her walk right into a potentially dangerous situation. She needed help. I didn’t give it. I kept waiting for the “What Would You Do?” guy to step in at this point. The guy who brings a microphone and tells you, “It’s okay none of this was real.” He never came. Someone did come. The child’s parents. They walked out of the building and called their children. One came. Another came, but the third was no where to be seen. The parents looked at each other and quickly went in the building to find their child. I still couldn’t get over it. I began to pray for the parents. Can I tell you it felt like way too little way too late? I could have stepped in. I didn’t. Sometimes that’s all we have to make a difference. That’s why I need God. I can’t be trusted to chose right as a reflex. I just can’t. I’m a lost child, too. I’m lost without God. I’m lost without his love in my life. I can’t bridge the giant chasm between me and my creator. All I can really do is take the dive. I can jump off the cliff that separates me from him and be caught by the net of his mercy and grace. That’s the kind of love to get all tangled up in. The kind of love that makes you want to be so close to the one who saved you that you don’t really know where He ends and you begin. The kind that speaks to my heart, hears my soul, yet still loves me more than I’ll ever deserve. That’s the kind of love everyone needs. Why would I want to keep that to myself? Why would I choose to see a lost child and not step in? Someone needs to hear why I hope, why I love, why I live now. I want to have a reflex reaction with the lost. I want them to be found. The time is short, I may only have the blink of an eye. I do know what will happen to the person who doesn’t know Jesus. No happy reunion. Forever separated from God. Just like this little girl, a lost person doesn’t always look lost. She is the woman next to you in line or the mom you just met in PTA. He’s the guy sitting next to you at the football game. He may have the biggest heart. She may be the best mom. That doesn’t make them any less lost. He needs you. She needs you. Hold out your hand. Lead them to the most loving Father they will ever know. Lead them home. You could change a life forever in the blink of an eye. Today was a frustrating day. The sad thing is that I could see it coming. We were sitting in the waiting room, when my son began to have a meltdown. He didn’t want to work on his math worksheet. He began rubbing his face and groaning while saying, “I hate math.” He tossed the math book down and curled into a ball in the chair. The eyes of people in the room began staring. I could feel them boring into my back as I tried to help him calm down. He was on the edge of completely losing it. It felt like I was on a stage unable to find my way behind the curtain. The spotlight was on us, yet I had a job to do. I had to forget the looks of those around me and focus completely on my child. I have a child with high functioning autism. In his world, change is the ultimate enemy. We had not done our normal routine and now we were both paying the price. I wish I understood the way he thinks. I wish I could take a look inside his brain and be able to help him, to protect him, to comfort him. I wish I could circumvent all the world’s woes. As a mom, all I want to do is make the bad stuff go away. Not being able to do that is painful. It hurts to see him hurt. It hurts to see others not understand. It’s tough to be patient when it takes my child an hour today to do what he could have done a few days ago in five minutes. My patience wears thin at times. This only stresses my child out more, which stresses me out more. It is a relentless cycle. The perfect storm. There is nothing I can do to stop it. It will come. I can only try to understand and guide him through the next storm. As awful as those meltdowns can be, I am thankful they are brief. In our world, they don’t happen everyday. ( I know in some HFA children they occur several times a day.) I am also thankful for what comes after the storm. Did I mention that my son has a smile that can brighten anyone’s day? The rainbow of his love shines through. It is God’s promise to me that he will be okay. My son is the most generous person I know. Last week he offered his sister all his chore money, so she could get the ipod she had been saving for. He sees things we don’t see. He loves with complete loyalty and laughs with everything he has. Our world is a mixed up place to him full of emotions that don’t make sense and people who are hard to read, yet he keeps going. He is an inspiration to me. Sometimes this world just doesn’t make sense to me either. Who understands why people riot in response to an unjust act? Who understands a government that has become corrupted by greed and selfishness? Who understands a comedian, a person gifted to make others laugh, taking his own of life? I will never understand this world. The pain it brings and the sorrow it inflicts are beyond my understanding. I am the teacher in my family, but today I think I will sit back and let my son teach me a thing or too. Today I will be the student who learns that love is worth it and tears are okay. Today I will remember the lesson of endurance. I will keep going even on the tough days because I never see him give up. Today I want to encourage you not to give up. This struggle, this uncomfortable season of your life isn’t all there is, my friend. Stop looking at it as never ending. All things must come to an end, both the good and the bad. One day we will be left with the remains. I can’t choose my struggles, but I can choose what remains in my heart. Unforgiveness, hate, and resentment lead to death, but when faith, hope and love remain in my heart I will be filled with life. There she sat. Silent. Waiting. There I stood. Shocked. I didn’t know what to do. How did this happen? Everything began with a floor. My husband had been working on the bathroom floor. Something had gone wrong as he began to lay the tile. He had to run to Lowe’s to get more supplies. I was cooking in the kitchen caught up in the whirlwind of the holidays. It had begun to get quiet in the house…way too quiet. “Wait a minute.” I thought. “Where is Beth?” At this point, my daughter had just learned to walk. I could easily tell where she was every moment by the sound of her crashing, banging, experimenting and laughing. My heart hit panic mode. Something was wrong. I looked and finally found her. She was sitting still. She was silent. She was stuck to the bathroom floor! My husband had left glue all over the bathroom floor. He had shut the door. He had told Beth not to open it, but she did. She knew she was wrong, so she didn’t call out for help. She just sat there. Stuck and helpless, but determined not to get caught. I quickly evaluated the situation. I could just undo her diaper, which was the only part that was stuck, and lift her right out. I thought it would be easy. I was wrong! I took her diaper off only to find that she was covered in poop. As I struggled to get her out of the diaper, she leaned back and stuck her hands to the floor. Trying to get baby hands off a glue covered floor was not an easy process. I was so concerned about getting her unstuck without her hands getting hurt that I didn’t realize I was getting stuck, too! Finally we both got off the floor. I called my husband to vent my frustration as he tried his best not to laugh. I’m pretty sure that was a day we will never forget! I learned so many things from our “stuck to the floor” experience. The first thing was that I should always keep a close eye on my daughter! I also learned how easy it is to get stuck and not want to ask for help. So many times when I get stuck in a situation, I try to pull myself out. It usually doesn’t work. In fact, I get more stuck than ever before! I may try to deny it. “Maybe if I just sit here and be really quiet, people won’t notice the big problem I’m stuck in.” Pride is what keeps me stuck most of the time. It’s when I admit that I am helpless, that change begins. I expect punishment. After all, I crossed the line. I knew it was wrong. Instead, God does something totally unexpected. He stoops down into my struggles, my hurt, my hangups, and my pain. He isn’t afraid of my mess. He just sees his child. The child he loves. He reaches out his hand, pulls me up and washes all the nastiness off me. This is grace. There are so many other things God showed me from this silly event in my life. Tell me, friend, how did it speak to you? Bethany Beckett is today’s special guest blogger on God’s Girl. Bethany is a Jesus-lovin’, great style rockin’, army wife and wisdom filled mama of 6 boys who currently resides in Tacoma, Washington. She has the gift of organization and a knack for all things crafty. You can visit her website at http://www.etsy.com/shop/TheWhimsicalTree to order her homemade items for children and the home, but please read her blog post first! Today I prepare my wardrobe for the adventures ahead regarding the errands for they day… comfy jeans, sneakers, and my “Yes, all those kids are mine” t-shirt. You see, I am a mother to 6 wonderful boys and beginning to “rock out” my newest “baby bump” for little one number 7. We all load up the Chevy Traverse and begin our day. I have a strict routine of running all of my errands in the same day… Yes, it means a very long day and sometimes a handful of meltdowns, but I have found that time, gas, and energy are saved this way. It’s much easier to knock out groceries, post office, doctor’s appointments, and bank trips all at once, than to have to dress, pack snacks, etc., for all of us, numerous days of the week. I call it “one stop shop” although most times, it involved quite a few more than one or two “stops”. Nonetheless… We load up for our day. We get to the Army Hospital where all of our care is, since my husband is active duty, and today we have 3 children with back-to-back appointments. As we unload the SUV I take a glimpse at my wonderfully large family and chuckle to myself about how we somewhat resemble a clown car, one by one exiting the “what seems too small for our family on the outside” vehicle. With one in the stroller, 2 holding on to my sides, and the others following, we resemble a family of ducks headed into the building. As I walk inside and pass all the other patrons, I hear whispers of “oh, my! “all boys!,” and “1…2…3…4…5…” I proudly hold my head up high (because this time they are all behaving well) and continue on to our destination. I wait patiently in line to check in at the counter as my little guys all grab seats and peruse the selection of tableside magazines. I think to myself “success!” and smile inside. My turn arrives and I approach the desk. The pleasant receptionist smiles at me and raises her eyebrows in a surprised expression and states, “Wow! You do NOT look like you have had that many kids!” Politely I smile back at her and reply, “Thank you,” as I let out a slight chuckle. But honestly, what am I supposed to look like? Perhaps if I looked like I had “six kids and counting” I would have 8 arms, like an octopus! One for each little hand to hold on to, and two to do laundry, dishes, cooking, and the like. Maybe I’m supposed to have untamed hair with Legos sticking out of matted tangles. Perhaps every time I went somewhere I would wear evidence of my children on my clothing. Like the time I went to work with half of a strawberry pop tart sticking to my cardigan like a broach on my shoulder-blade. Maybe the perception of motherhood has been so distorted by society that everyone forgets about the joy children are… I promise you that I have more laugh lines than I do frown. While I understand and agree that raising children is exhausting and often sleep-depriving, I think that some people assume that mothers of many could only possibly look ragged and worn out. I mean, if one child is a lot of work, it must multiply for each additional child, right? Not always… If I broke down how I felt into percentages of happy, exhausted, hungry, ambitious, etc., and I was 20% exhausted with one child, that doesn’t mean that I’m 40% exhausted with two, and so forth… No, it just simply that the scale changes. The balance stays the same. Or maybe because I have so many children I am expected to carry that extra bit of “baby weight” with each one. Honestly, chasing around this many tots would keep almost anyone in shape! And don’t you remember the times you made yourself a plate of dinner and your little one begged for a bite? Multiply that. Sometimes I feel like I never get to eat! Haha! Although I know that is not true. They just help me avoid overeating. Except for the Oreos I secretly stash in my bedside table drawer. We are supposed to look like Christ. Every child I have had has helped shape me into a better person. They have made me less selfish, more loving, more understanding, compassionate, resilient, persevering, more giving. I can see joy in little things, like finding a dragonfly for them to marvel and wonder at. I enjoy the smiles of innocence in playing in rain puddles. I cook awesome, yet budget friendly meals. I teach them to pray. I teach them to love. Laughter and playing are an everyday occurrence in our house. And so are little spats, naturally. But video games, lack of socialization, selfishness, and greed are not. I think our time with our children, and their time with their siblings is to be treasured. And so often that time just gets away from us and passes us by. So, while, to some, I may not look like I have this many kids, neither does the mother of one who is sitting along side of me, face deep into her smartphone, while her child rolls around loudly on the floor simply seeking her attention, or begging to play her phone while they wait. Last week on the God’s Girl blog I talked about what it’s like to be a new Christian. It’s like opening a new box of crayons. But, the Christian life isn’t sunshine and roses all the time. Things in life can and will break you. After a while your box of crayons contains broken pieces. I talked about how God can and will use your brokenness. Today, I will be talking about what happens when you are a Christian under fire. Have you ever felt mistreated for what you believe? Maybe someone spread something that wasn’t true about you. No one bothered to check the facts. Their fiction became your public story. If you are a Christian you must hate gay people. People think they know you by the label you wear. Christians are known for what they stand against more than what they stand for. You must be a hypocrite. I talked about not feeling like I truly belonged with non-Christians or Christians. I was fourteen when I asked Jesus to take over my heart. Fourteen was a confusing time. I wanted to belong to every group. I just wanted to be liked and feel like I fit in everywhere. As I matured, I began to find people who were serious about what they believed and real about what they faced. I wasn’t the only broken pack of crayons. There were others who were pretty broken and loved Jesus, too. We banded together through some hard times. God used the heat in our lives to melt us and mold us together. You know what happens when God does that? Have you ever taken broken crayons and baked them together in a muffin tin? They become one big rainbow crayon. I loved playing with these as kid. I could make instant rainbows! The mega-rainbow crayon doesn’t break easily, either! I remember trying to break those suckers. It definitely wasn’t as easy as a single crayon. That’s what happens when you find good friends who will stand by you when the heat turns up a notch or you find yourself in a blazing inferno. You learn to appreciate the differences you have. Your friends may be blue, green, yellow and red. When you get together something way more beautiful than the one color you have to offer comes out. A crayon block of many colors isn’t easily broken when God presses and molds it together. Sometimes these are the friendships you never saw coming. They are forged in the fire. Friends who will pray for you and with you. Friends who will do a happy dance when you succeed and hug you when you fail. The kind who love you for you, even on your ugly days. These are the best kind of forever friends because your relationships will never end. You’ll be praising God together, laughing, loving and living at His throne here and in heaven. Today, take a moment to pray for your friends. If you don’t have these kind of friends, ask God for them, then put yourself out there. He loves to give good gifts to His children. Remember your first day of a new school year? New boxes of crayons and newly sharpened pencils tucked inside your favorite backpack. Excitement lingering in the air. Remember taking that first day of school photo? You wore the biggest smile. You put on your best clothes. Everything was just how it should be. Then the first test came. Whether it was Science test you bombed or the friends who asked you to pick sides. There was always a test. Suddenly, everything wasn’t so crisp and clean anymore. Life began to get messy. Those perfect crayons and pencils were soon broken or lost. You didn’t get the fun teacher for math. Nope, you got the mean one. The one you were certain wanted to ruin your social life with demanding amounts of homework and tests from hell. Pretty soon, you found your heart yearning for summer. When I became a Christian, I started out with that “Fall” attitude. The Christian life seemed perfect. Sunshine and a happy heart. No problems from now on. Jesus solved them all for me when He died on the cross. I became a part of something. I belonged with others like me, the Christian crowd was my home now. I would never be lonely, confused or hurt again. My non-Christian friends knew I had changed, but I was still trying to fit in with them while telling them about my faith. The Christian crowd wasn’t all it was cracked up to be, either. They could be cruel at times. To some of them “realness” seemed to pose a threat. They had their “clicks”, too. I felt like the new kid walking into the cafeteria on the first day of school. Where would I be able to sit? It seemed I didn’t truly belong in either group. The things happening in my life hurt at times. Ones that couldn’t be fixed by a cheery saying or a half-hearted promise of someone to pray for me. I thought I was supposed to live happily ever after. Soon dark clouds began to form over my sunny heart. Maybe I wasn’t a good enough Christian. Maybe I should just try harder. Just like those perfect crayons in the fall, I began my journey as a Christian ready to be used. I began to feel like a box of crayons halfway through the school year. I didn’t have my life together. I had lots of broken pieces. How could God use those? I wondered if God could ever use a messed up person like me. Could He ever put me back together again? I wanted to impress God by being that perfectly sharpened pencil. I didn’t want to break under the pressure. I had to show Him that I could handle it. He had to handle it for me. Every time I wrestled with my sin, I seemed to come out on the losing end. He didn’t die to make me perfect. He died because I needed saving. How could I ever feel completely at home here? I had become a citizen of heaven, leaving me feeling like a foreigner in a land where I once felt comfortable. How could I expect to wear this world like a cozy pair of pajamas when even Jesus wandered through it without a place to truly call home? Even the Son of Man had no place to lay His head. I didn’t have to be that perfect box of crayons. I didn’t have to have my colors all lined up on display to impress. What impressed my God the most was and is my brokenness. It brought Him to earth. It caused Him to die for me. Can broken crayons still be used? Broken crayons are the special ones when you think about it. They are guided more closely and used with more care,. Wonderful colors still come from them. Colors that add to the beauty of the big picture. One that I can’t see right now. That’s why I have to place myself under His mighty hand. Even on the messy, unraveled days, He will use me. Even when all I have to offer is a worn numb, He will use me. He will create His beauty in and through me. All I have to do is be willing to let him use my whole box. Lay everything I have and everything I am out before Him. My pretty pieces and my broken pieces, too. Trust God, friends when the road is beautiful and clear, but also know He is with you are your dark days, too. He will never stop using you when you spill out your box before Him. What was your experience as a new Christian like? Was it similar to mine? I used to love to go to Cheddar’s when I was a kid. It had nothing to do with the food. If I drank my milk my grandmother would give me a quarter. Back in the day a quarter went pretty far. I would head straight to the video games. One of my favorites was Pac-Man. How many of you remember playing the original arcade game? 1) Trust me, you missed a great era. 3) Read on anyway, you will get the idea. Oh, the satisfaction that came from eating that big dot and getting rid of those ghosts! Can you name all the ghosts in Pac-Man? Ok so I can’t quite pass that test! Maybe you can remember them all. I bet you can remember playing the game though. Looking back now, I feel sorry for Pac-Man. All he was trying to do was eat tons of dots to get to the next level. That should be easy enough right? Not a difficult task…UNTIL…the ghosts show up. They harass the poor guy. They try to eat him alive for goodness sake! He now has to move faster to eat those dots AND he has to dodge them at the same time. Have you ever felt like Pac-Man? Your day begins with tasks laid out before you. Everything seems calm and peaceful…Until…you guessed it…“the ghosts” come in to try to eat you alive! Now I have no idea what “your ghosts” are. They can be “down in the dumps” thinking or really anything that stresses you, drains you, or gets you off task. They can quickly turn you from “Happy” to “Grumpy” as you go about your day. Chances are you will encounter some this week. So how can you respond to them? He eats the big dots as he goes about his day of tackling the little dots. The big dots give Him energy. All of a sudden the ghosts don’t seem so threatening anymore. He chases them down eats them up quickly, then gets back to business. The big dots give him the strength to get the job done. Today let’s focus on something that will bring you strength as you go about your day. You can just think of these in your head if you want. Quickly write down 5 favorites. These can be five favorite people, memories, places, or things. Don’t spend much time on this just write as quickly as you can. You may be surprised by what you jot down. Now take a moment and praise God. He created ALL your favorite things and so much more. You are one of His favorites. “So if you’re serious about living this new resurrection life with Christ, act like it. Place the list you just made on your desk or somewhere you will see it often. Take praise breaks here and there. You can even add to it over time, if you want. When the little dots seem to never end or the ghosts are chasing you all over the place, take out your list and praise! Last night my daughter had a sleepover to celebrate her 11th birthday. Lots of girls, lots of cake, lots of laughter, and lots of fear. The girls had fun most of the night until late night paranoia set in. Suddenly someone heard heavy breathing followed by lots of gurgling. I watched as they tried a variety of methods to make the sound stop. They decided to change the room they slept in. Maybe if they tried switching around the spots they slept in the sound would stop. I tried to explain that they were just hearing the sounds of each person beginning to fall asleep. They looked at me like I had lost my mind for even suggesting such a thing. “The thing we are afraid of is real. Can’t you see that?”, they seemed to say. These girls were not hanging out in dark scary rooms. As a matter of fact, the sleepover had a glow-in-the dark theme. The girls were surrounded by light. They slept in a sea of glow sticks and glow balloons, yet all they could think of was the darkness. Have you ever noticed how emotion spreads through a group like wildfire? One person gets scared, then fear spreads. You talk to a negative person enough and suddenly you can see flaws in others you never saw before. You get swept away in what appears to be real. After all, if most of the group is feeling it maybe you are the crazy one. Is it wrong to share your feelings with friends? Should you just walk around with a plastic smile? Emotion isn’t bad at all, but accepting the emotion as the complete reality you are living in is dangerous. It’s like being in a dark room full of those glow sticks yet never seeing the light all around you. Have you ever noticed that glow sticks don’t last forever? Eventually they just burn out. You can’t create your own light. That’s why we need the light of God in our life. We have to spend enough time in God’s word, that His word becomes the last word to resonate in our hearts when we feel the darkness closing in. If we don’t keep returning to Him our light won’t stay lit. We will give in to whatever emotions we create and feed off the emotions of others. Emotions aren’t wrong, but they aren’t always reality either. That’s why our group of friends is so important. The good ones will call you on your crazy and allow you to call them on theirs. We all need people in our lives to tell us like it is with their mouths while they point us to God with their fingers. They will become the climate you acclimate to. You will become like the people you are around. Remember friend, they will also become like you. The girls in our home may have been a little scared last night, but they woke up this morning laughing, loving and hugging. Sorrow may last for a night, but joy comes in the morning! Real friends will walk with you through both seasons. If you have the kind of friends who encourage you, who point you to Jesus and aren’t afraid to call you on your crazy, give them a little shout out in the comment section below these words. Tell us what you love about them and why. Share this blog post on Facebook and tag them. Let’s thank God for them today! So much time is spent apologizing. Just think of the people you have been around this week. How often have you heard the words, “I’m sorry”? How often have you said them? Why do you apologize for who you are? What are you really doing when you apologize? You, my friend, are buying into the big lie. The one that says you aren’t enough. The one that says you are too much. The voice in your head that says you must tone it down or crank it up. The one that says you aren’t okay. So you strive to fit in. You take some of you and cram it in the corner. You take the light, the essence of who you are and you cover it. If people lifted the veil, they wouldn’t like what they see, you tell yourself. Right now, right here, let me rip that veil and expose the lie. The one that keeps you from being you. The one that holds you back. Funny thing, that lie isn’t really about you at all. When you hide or change, you are really saying you want to hide or change the God who made you. He didn’t make you to be enough. He made you to be too much. He must have messed up because you aren’t perfect. Most lies have a hint of truth to them. You see, friend, if you were enough Jesus would not have had to die for you. Stop thinking about all the things you have to do today and dwell on this. Jesus shining through your weakness is enough. He will work in you. He will work through you, but to allow Him to do it, you must pull those hidden parts from the corner and bring them out into the world. Your boldness may just speak what needs to be heard. Your quietness may bring calm to a situation that’s getting out of control. Your vision may help others to see. Your faith may bring others courage. Your words may speak straight to a discouraged heart. He made you that way. He is making you everyday. Shaping you in His image, to do His will. His perfect, pleasing, good will is working in you right now. Will you let it shine? Will you stop apologizing and shoving parts of yourself into that corner? Jesus certainly doesn’t belong there. Someone needs what you have today. Even when you think you bring nothing, when God is working through you, you are always bringing something. Today, encourage others to just be themselves, by just being yourself.